Summer is almost over and school is starting! What better way to add to the excitement of your child to be back in school that helping him/her choose the right bag for the big day? Wheeled backpacks are the craze for kids of all ages, including those adorable babies in preschool (depending on their height and age) or those kids in grade school. 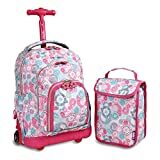 A great way to start your search is through checking out J World New York Lollipop, a rolling backpack that comes with a free lunch bag that matches the design of the luggage. PROS: It is big enough to fit books, notebooks and other school supplies as well as clothing and travel necessities when going on holidays. This is a dual-purpose bag that can be used for both school and travel, as well as other purposes it may serve. This saves you money for buying different bags because it is very versatile. For the affordable price, you will also get another mini-bag that can be used specifically to store packed lunch or snacks, but also may be used for other purposes. The lunch bag matches the design of the rolling backpack, making it so cute to tote around. CONS: Some customers who left negative reviews on the product complained about poor quality of the handles and the zippers. Like most rolling backpacks, users always find fault in the handles as it breaks easily or pulls off easily. The problem here is poor quality control: You received an already defective item or the quality of the product you got didn’t live up to the expectation. To solve this, you can return the product to the manufacturer for replacement, especially if it already broke only after a few months’ use. You should also watch how your child uses the bag; remember to tell him/her not to lift the bag through the handles as it puts too much unnecessary pressure. What are the important aspects of the J World New York Lollipop? Size: The size of this bag is just right for the belongings of your toddler or grade schooler who will use it for school. Books, notebooks, and all stuff for school can easily fit into the wide main compartment. However, some parents have complained in their reviews that this may be too small if your child is in the advanced years of grade school and is carrying more books. Also, if you are putting a lot of school needs into the main compartment, you won’t be able to fit the lunch bag in there. You have to carry it separately. To give you an idea on the size of the bag, the dimensions are 6 x 16 x 12.5 inches. Measure it with your child’s existing bag so you won’t be surprised with the size when this one arrives at your doorstep. 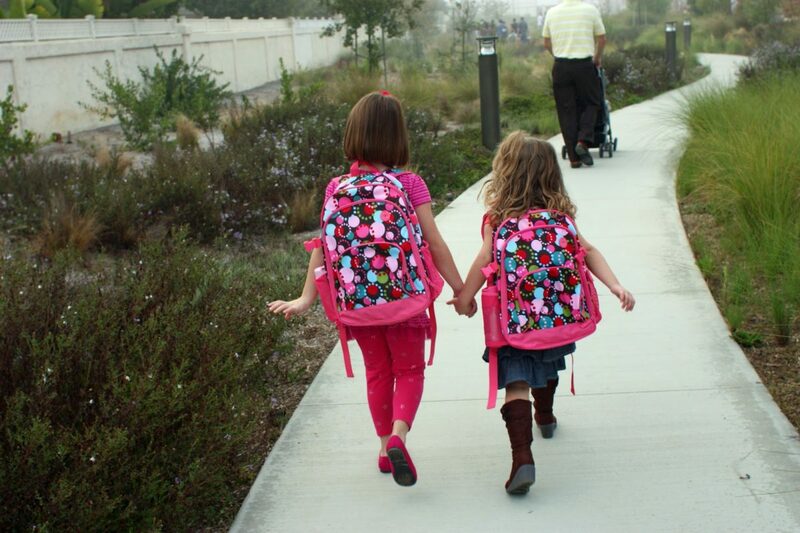 Purpose: Designed for school, this bag can easily become your child’s buddy to school. At the same time, it can be used for travel due to the fact that it is also roomy enough to fit clothes and other travel essentials. This allows you, the parent, to avoid having to carry your child’s belongings, giving them a sense of independence even at a young age. It’s a great bag to use for both school and travel because the wheels are sturdy enough to handle all the weight of the stuff you need. It rolls nicely and won’t give your child’s arm too much strain when pulling it behind. The lunch bag is a nice addition to it as well. Materials Used: The bag is made of 100% polyester material that can be washed and scrubbed without having to worry about fraying cloth. Kids are prone to spill drinks and food onto their bags so it’s nice if parents can wash the bags without problems. It’s also very easy to clean; you just have to wipe it most of the time. There are mesh pockets located at the sides of the bag for storage of water and juice bottles. A rubber stopper is also fixed in front of the bag for added support in front. The wheels are made of sturdy rubber and plastic and rolls with ease even on rough pavements. The handle is made of plastic but the body holding it is made of sturdy metal. Comfort: The handle is just the right height for elementary kids but it can be adjusted lower to suit kids in preschool. It is also very comfortable when used as a backpack because of the padded back which gives more support on your child. The straps are covered in mesh and are padded for added support and comfort onto the shoulders. What other things should you know about the J World New York Lollipop? Boys and girls alike are given a lot of choices for this bag. It is designed in such a way that it will appeal very much to youngsters. The bright colors and fun prints are a great way to showcase your child’s fun loving aura. It comes in color Pink, Orange, and Yellow for girls and Blue and Green for boys. There are additional appliques printed on the material itself while the zipper holders are attached with adorable rubber shapes of flowers, butterflies, and gears. It is adorable and functional as well because there are a lot of pockets in front that comes with a built-in organizer for your child’s smaller school stuff such as pencils, crayons, sharpener, and eraser. The lunch bag is slightly padded to ensure that your child’s food will remain hot or cold. There’s a side mesh pocket attached in the lunch bag for drinks. The J World New York Lollipop is definitely a great pick for your child entering preschool or grade school. It is not only terribly cute, but it is functional and durable as well. Your child will be able to get years of usage out of this bag as well as the accompanying lunch bag. For the price, it is really worth it. Getting ready for the beginning of school involves buying new bags or rolling backpacks for your child but that is if the one he/she used last year needs replacing. This will be very exciting for both you and the child as there are endless choices out there. Pick something nice and sturdy for your child, to save you from buying bags each year. In this review, we will focus on the adorable J World New York Sunrise Rolling Backpack, an affordable yet super functional bag that is perfect for kids of all ages for school or for travel. PROS: It is the perfect size for both toddlers and those entering grade school because of its wide enough compartment that can fit most of their belongings. Apart from that, this can also function easily as a travel bag or an over nighter as it can accommodate all the clothing and other stuff needed for travel. The backpack rolls smooth so your child won’t have any trouble dragging it behind him. When used as a backpack, it is thoroughly padded to ensure comfort while carried. The metal parts are also hidden in view so that it won’t get in the way if carried as a backpack. CONS: The handle is prone to breaking so you need to take careful measures with it. First, don’t carry the entire weight of the bag through the metal handles used for rolling. Instead, carry the bag through the mesh handle located atop the main body of this rolling backpack. Be careful in rolling this bag in places where it can fall or tilt sideways down deeply on the sides of a walkway. It will put too much pressure onto the metal handle and body, causing it to break. Although that the handles and the body are pretty sturdy, it’s not made of unbreakable metal. What are the important aspects of the J World New York Sunrise Rolling Backpack? Size: The J World New York Sunrise is roomy enough to house all your child’s belongings for school or for travel. If you are not sure about the size, take note of the dimensions 9 x 18 x 13 inches and measure it on the existing bag of your child to get a rough idea on the size of the bag. This bag will fit three to four books of your child, notebooks, folders, and binders with ease inside the main compartment protected by sturdy zips. In front there’s a single zipper pocket that has a built-in organizer for your small stuff. The pocket in front is not that big and won’t fit too much bigger stuff, such as snacks and food. But it has provisions for pens and keys as well as small pockets for your kid’s cards and smaller notepads. There’s a smaller zip in front of this pocket for coins and whatnot. Found on both sides of the bag are mesh pockets for other smaller items as well as water or juice bottles. 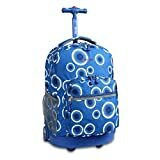 Purpose: This rolling backpack is pretty good not only for school use, but also for travel use. The front pocket is great for easy accessibility, like storing IDs and Passports for travel while the main compartment can easily hold a few days’ worth of clothing. The wheels of the backpack are also pretty neat and sturdy for long walks during travel and it can easily support the weight of whatever is placed in the bag. When forced to go down a few flights of stairs, you child won’t have to worry about the wheels because he can easily slip the backpack behind him to carry it down. This makes it efficient for both use at school or travel. It will save you money in the long run because you won’t have to buy separate bags for your child. Materials Used: This bag is made of 100% polyester material. It has sturdy stitches that won’t fall apart easily, unless faced with strains and abuse all the time. Although considered durable, this bag can face wear and tear after a few years of heavy use; don’t expect that it will last very long. The handles are made of plastic while the body of the handle is made of metal for more durability while in action. The wheels are smooth sailing and are easily maneuvered, even by the hands of little children. The shoulder straps are covered in mesh and are padded for added comfort while worn as a backpack. What other things should you know about the J World New York Sunrise Rolling Backpack? Kids would easily love this bag because of its shape that holds really well despite being empty or full. It is also the just the right size of bag for kids both in pre-school and grade-school, so you don’t have to worry about your child overgrowing the bag. It also has a lot of distinct designs and colors for both boys and girls. Boys can pick from darker colors such as blue, red, and black laced with stripes and geometric patterns while girls can choose from bold colors such as pink, green, and yellow with flower, dots, and twirl designs. The polyester material, although not fully stain-free, can be easily washed and scrubbed in case your child accidentally spills drinks or stains it with food and dirt. You don’t have to worry about the bag looking saggy and old if washed because the polyester material can hold on to its shape and fabric quality even after baths and rinses. The J World New York Sunrise Rolling Backpack is definitely one of the most recommended bags out there for kids of all ages because of its timeless design and shape. Kids won’t have any problem choosing the design and color they want because of the vast choices available. Not only that, the sturdy materials used and comfort provided by the bag ensure that your child will use the bag with ease for years to come, which will save you money in the long run because you won’t be forced to buy bags every now and then.